Margate Beach Patrol Chief Richard Kugel, (in white) goes over instructions with aspiring lifeguards before the Margate lifeguard tryouts at Washington Ave. beach, Margate. Sunday June 14, 2009 Retrieved from Press archives. 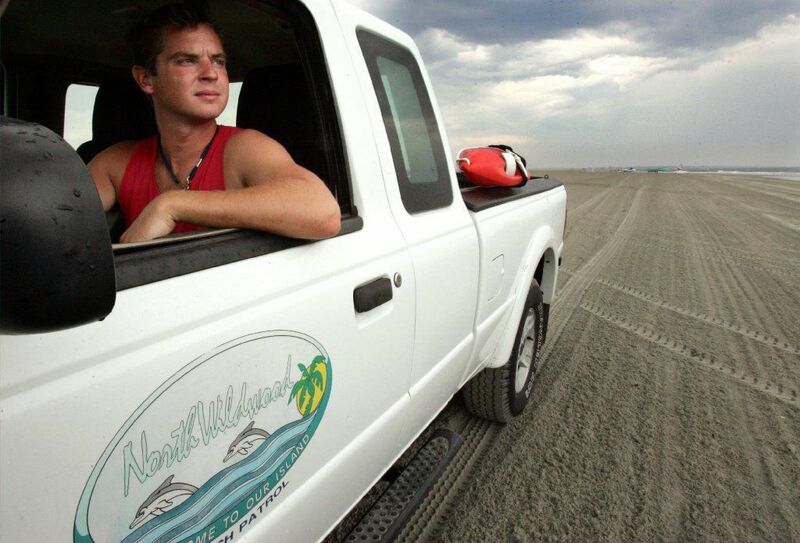 North Wildwood lifeguard Chris Jordan patrols the beaches of North Wildwood keeping beach goers off the beach due to lightning in the area. Weather art from Cape May County. Wednesday July 1, 2009. Retrieved from Press archives. Craig Whitehead at left and Shane McGrath at right with the Avalon Beach Patrol win the Upper Township Beach Patrol Six-Mile Bay Row in Strathmere in Upper Township Monday July 20, 2009. The race begins and ends in the bay at the Deauville Inn. Retrieved from Press archives. Long Beach Township Beach Patrol Capt. Tom Duralek on the beach in the North Beach Section of Long Beach Township. Tuesday July 21,2009 Press archives. Atlantic City's Michelle Elberson and Kara Beres places first in sprint doubles row at Women's Invitational Ocean City Beach Patrol Wednesday, July, 22, 2009. Ventnor's Debbie Bateman places first in sigles row at Women's Invitational Ocean City Beach Patrol Wednesday, July, 22, 2009. Sea Isle City's Amy Schrader and Becky Lederer, left and Ventnor City's Debbie Bateman Meg Holland battle each other in sprint doubles row at Women's Invitational Ocean City Beach Patrol Wednesday, July, 22, 2009. Wildwood's All McCrosson and Marie Cirelli battle a wave in sprint doubles row at Women's Invitational Ocean City Beach Patrol Wednesday, July, 22, 2009. Upper Township's Mary Ellen Curran and Cara Thomas battle a wave in sprint doubles row at Women's Invitational Ocean City Beach Patrol Wednesday, July, 22, 2009. The women compete in run swim race at Women's Invitational Ocean City Beach Patrol Wednesday, July, 22, 2009. Margate's Kate Mattola , left and Cape May's Erika Axelsson, right compete against each other in the singles row race at Women's Invitational Ocean City Beach Patrol Wednesday, July, 22, 2009. The women compete in surf dash race at Women's Invitational Ocean City Beach Patrol Wednesday, July, 22, 2009. The women compete in the surf dash race at Women's Invitational Ocean City Beach Patrol Wednesday, July, 22, 2009. Wildwood Crest's Rose Brenner and Kenna Moran places first in paddle pick-up race at Women's Invitational Ocean City Beach Patrol Wednesday, July, 22, 2009. Wildwood lifeguards Jason Arcinese (left) and Brandon Joyce, walk back to patrol headquarters on Lincoln Ave after a row in the ocean. 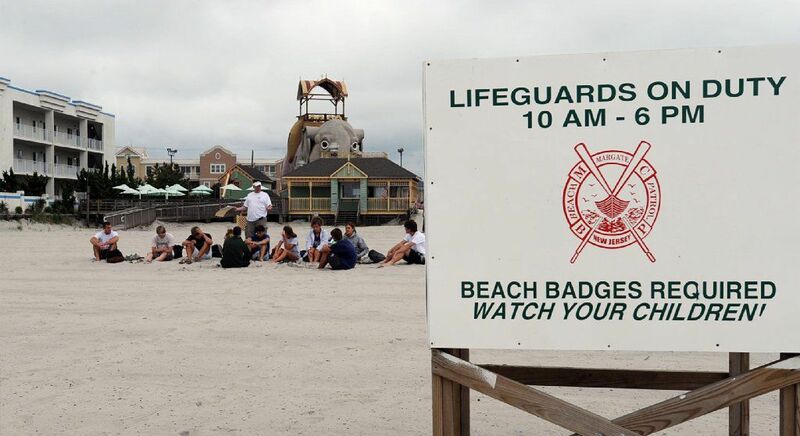 Wildwood lifeguards go through early morning workouts in the ocean in front of beach headquarters on Lincoln Ave, honing skill that will keep them sharp for lifesaving situations. Tuesday July 28, 2009. July 7, 2010: Joe Callahan (left) and Gregory Smith (right) from the Ventnor City Beach Patrol row the final leg to finish in 1st place during the Doubles Row Relay at the Cheif Bill Kuhn Brigantine Invitational Races on the 15th Street Beach. Lifeguards steady the tower as the Judges pay close attention to the swimmers at the Ocean City Beach Patrol Women's Invitational at the Ocean City 34th street beach. The Atlantic City Beach Patrol’s Mike Sykes, left, and Pete Egnor carry the rescue bag ashore after rowing through the waves to win the combination rescue at the Goudy Rescue Races on Friday night. Jack Fenton completed the swimming leg for the victorious trio. Members of the Atlantic City and Avalon beach patrols row out into the waves during the doubles row rescue Friday.